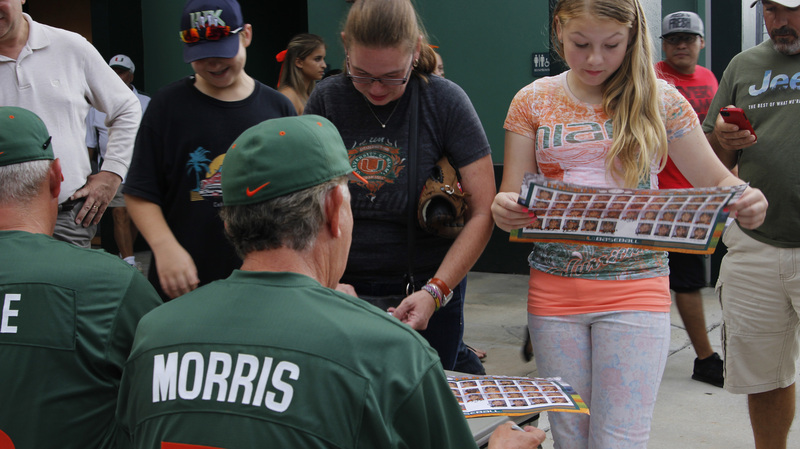 Baseball fans clamoring for the 2015 season to begin can head to Alex Rodriguez Park at Mark Light Field Saturday as it comes alive for the annual Hurricanes Baseball FanFest and Alumni Game. The Alumni Game traditionally takes place the weekend before the start of the season as an exhibition game between the Hurricanes baseball team and former players who have graduated, many of whom have gone on to play for Major League Baseball. Former Hurricane Chantz Mack (Seattle Mariners minors), who has played on both sides of the Alumni Game, said that it is a good test game for the team. Players who have returned for the Alumni Game in the past include Jon Jay, outfielder for the St. Louis Cardinals and World Series ring holder; Yonder Alonso, who has played for the San Diego Padres since 2012; and Gaby Sanchez, a former Pittsburgh Pirate who was recently signed to play professional baseball in Japan. An autograph session with the coaches and players will take place from 4-5 p.m., when fans can get their hands on a 2015 team poster. For the young children who tag along, Saturday’s activities will include face painting, inflatable bounce houses and other games. Alumni will take to the field for batting practice at 4:15 p.m., and Hurricanes alumni and current players will be introduced to the fans starting at 5:30 p.m. Following FanFest, Hurricanes Baseball alumni take on the 2015 team at 6 p.m. The activities and game are free. Mack said the Alumni Game is a good opportunity for fans to get an early look at the current team in action as well as to see their favorite former players. This year, the alumni lineup includes Mack, Chris Hernandez (Boston Red Sox AAA) and Alex San Juan (2013 graduate). Last year’s graduates Javi Salas (Milwaukee Brewers minors), Dale Carey (Washington Nationals minors), Tyler Palmer (Los Angeles Angels minors) and Alex Hernandez (Houston Astros minors) will also play against many of their former teammates on the 2015 Miami Hurricanes team. Mack, who returned for the Alumni Game for the first time last spring, said it can be a strange experience playing against old teammates. The Mark Light Shake stand will be open throughout the day for its 30th season of serving up milkshakes, including a new cookie dough flavor in honor of the Sugarcanes bat girls. Fans can look forward to opening day the following weekend. The Hurricanes open the 2015 season at home with a series against the Rutgers Scarlet Knights beginning 7 p.m. Friday, Feb. 13.